The most compelling character in the indie horror-drama The Cured is a nameless, tertiary woman: a person in the middle of being cured of a zombie virus, held in a medical transition space as she reverts from a frenzied maneater to something resembling a human again. Considering the casting of Ellen Page and the emphasis placed on the other people in the story who've been impacted by the calamity, ranging from saddened families to politicians whose aspirations were halted by getting infected, this comes as a bit of a shock. One can appreciate the ideas in which David Freyne hopes to realize in The Cured, in which he explores stigmas placed on those without a choice in the matter and grappling the violent things one has done in a past life. Without layered characters or potent scares, however, what's left over is a culmination of dour ideas without enough of a body to put them in motion, which leaves one searching for something, anything -- like a small side character -- to latch onto for substance. Set in Ireland, which is recovering from the worst effects of a continent-wide zombie epidemic, The Cured follows a pair of men who have been given a revolutionary treatment that heals the disease. While the calamity itself may be purged from their systems -- enough to make people look and think like humans again; not quite enough to get rid of certain genetic markers that can be tracked/scanned -- they're left with one particularly harrowing side-effect: they remember everything they did, everyone they ate and/or turned, during the period. As they're introduced to society with new jobs, they struggle to reintegrate: one man, Senan (Sam Keeley), tries to get back to normal around his sister-in-law (Ellen Page) and her child, working at the reintegration facility with a doctor and patient; and the other, Conor (Tom Vaughan-Lawlor), once a politician, feels the harshness dished out by the people and the mundanity of his newly assigned job. While one copes with memories to become human again, the other teeters on the brink of lashing out. Zombies being transformed back into humans isn't an entirely new concept -- the horror-comedy Warm Bodies sunk its teeth into that idea -- but it's not one that has really been approached from an honest dramatic standpoint, which is usually reserved for depicting humans transforming into zombies (see: the underrated Maggie). Perhaps it's because the logistics of making that happen, of revitalizing the human brain from either a necrotic or infected state after a prolonged period of time, are so out-there that it's tough to take in earnest … yet a little funky technobabble could ultimately make it work. The Cured doesn't really attempt that: David Freyne's script remains vague about the cause and functionality of the animal-derived "plague", as well as the medical resolution created to fix it. The world-building isn't terribly interesting here, instead seeming somewhat obligatory and hands-off as if to preserve to illusion of how this scenario might play out in the "real world", evading details in hopes that the audience will fill in their own gaps. By doing so, Freyne's world itself lacks detail. Of course, one school of thought involving horror and sci-fi writing suggests that so long as the characters and themes accomplish unique and engaging things, that "science" can remain inconsequential. 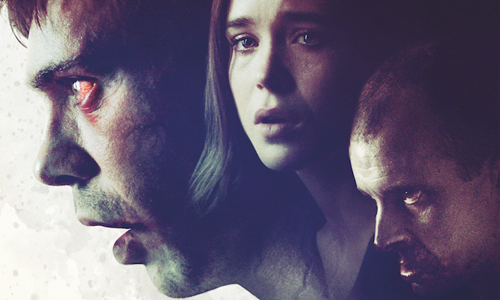 Unfortunately, such can't really be said about The Cured either, as the dramatics rarely go beyond its austere surface. There are flickers of ideas here regarding how people cope with stigmas -- stemming from genetics -- that they cannot control, as well as post-trauma stress and how people might move on from mistakes made in their past when they were "different people". It's a stretch to get to that symbolism, though, and looking at the events through that lens doesn't add much to the film, which revolves around varying degrees of shunning and skepticism toward those who were once zombies. The straightforward aspects of the characters don't really help the process along: Senan's desire for assimilation and Conor's revolutionary spite are in effortless opposition, and their kinship hinges on cannibalistic actions from when they literally were thinking like monsters instead of themselves. Since The Cured doesn't rely on upfront scares, instead concerned with the permeation of terror and the complications occurring within, its momentum hinges on the staying power of grim anarchy: what happens if those that sympathize with actual zombies "partner" with the few that remain and upend the status quo. Freyne does generate a degree of dread and unpredictability once the chaos starts taking over, yet that volatility also results in the film's maddening final gut-punch of a twist, one where the sobering expressiveness of Ellen Page's turn as a traumatized mother can't overcome the infuriating contrivance of what's responsible for sparking her emotions. The primary character development ultimately ends in a wash, but at least there's also the story of that older awakening zombie woman I mentioned earlier, which culminates in a halfway sincere, heartbreaking arc once her identity gets revealed. Her progression is what The Cured needed more of … along with a little extra gore, perhaps.